The latest DVD boxset from the Retro-Speedway 'time machine' takes us back further than ever before - back to the 1950s and 1960s. This was a most interesting period, starting off with little changed since pre-war and ending up in what could be termed the 'modern era'. Along the way there were tremendous highs and lows, meaning there are no shortage of talking points. The double-DVD set takes the usual approach of mixing archive footage, vintage photographs and reflective interviews. There are no shortage of stars looking back on days gone by, including the biggest names of the era such as Barry Briggs, Ronnie Moore, Ivan Mauger and Ove Fundin. The first DVD (running to 90 minutes) covers the fifties, the second (just over two hours) the sixties. The story is told in roughly chronological order but explores tangents as and when they become relevant. Not every year is covered in the same detail, in particular the last few years of the fifties are given scant coverage - perhaps reflecting just how deep a decline the sport hit at that point. What stands out immediately is the quality of the colour footage available from the fifties. Right from the off we are treated to colour film from Old Meadowbank where the local Monarchs are seen taking on local rivals Ashfield Giants and Glasgow Tigers. As well as on track action, there's plenty of behind the scenes footage as well, including a young Ken McKinlay taking a draw from a fag as he warms his bike. Moving down south we also see colour action from Norwich as the Stars take on New Cross then Belle Vue. It's difficult to imagine another Norwich/New Cross fixture ever occurring so it's great to see these legendary teams in action once more. Again there's footage from the pits, Peter Craven borrowing a programme from a mechanic amongst it. This was the era of concrete starting grids, handicapped starts for 'the big five' and fans wearing shirts and ties. It's all here in the DVD. The sixties DVD is just as good, kicking off with those harum-scarum early days of the Provincial League, beautifully illustrated by colour footage from the likes of Sunderland and Newcastle. There's also rare film from Southampton, not a track that many will have seen before. The infamous '64 season when the riders rode 'black' provides many great anecdotes, not least from Ronnie Genz who adopted a pseudonym to maximise his earnings. The Russians were big business in the sixties and their visits to the UK are generously represented through archive footage, including colour film of the Russian's receiving tartan travel rugs when they visited Glasgow. These odd little bits of video really do give a flavour/reminder of what speedway was like in the 'swinging sixties'. The tail-end of the sixties also brought us British League Division II, the new league that launched the career of so many great British riders. There's film from the likes of Doncaster, Crayford and (an exceedingly basic looking) Eastbourne to enjoy. The biggest names of the sport continue to share the memories during this second DVD and are joined by legendary sixties riders like Ivor Brown, Mike Broadbank and Terry Betts amongst others. The time flies by as you relive (or discover) these earlier, perhaps simpler, times. The production quality of the DVD really can't be faulted, though certain allowances obviously need to be made for the age and source of some of the footage. Tony McDonald is a well informed narrator, guiding us through the interviews and clips, all the time pushing the story onwards. 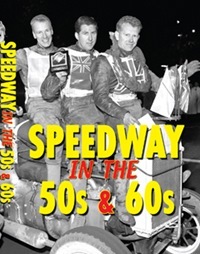 It doesn't attempt to be a comprehensive history of the decades, this is a nostalgic look back on the people, stories and tracks that speedway in the middle of the last century. An excellent and value for money product that will bear repeated viewings.